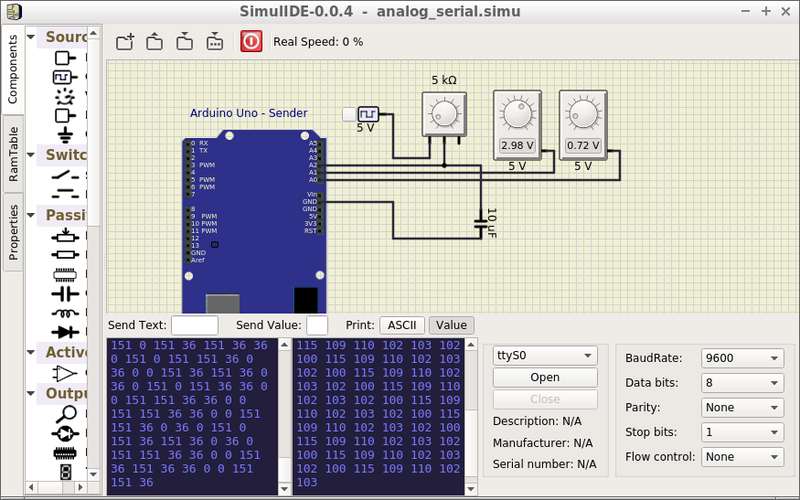 SimulIDE supports Pic, Avr and Arduino simulation. In Linux simavr is integrated in the executable, but gpsim must be installed in your system for Pic simulation to work. In Windows both simulators are integrated in the executable, you don't need to install nothing. To do a microcontroller simulation just pick the microcontroller yo want and drop in the circuit, then build the circuit yo need to test your fimware. When you have your circuit ready Right-Click on the microcontroller and select "Load firmware". - Open "Properties" tab in left panel. - Set "Mhz" property at the desired speed in MegaHerz. 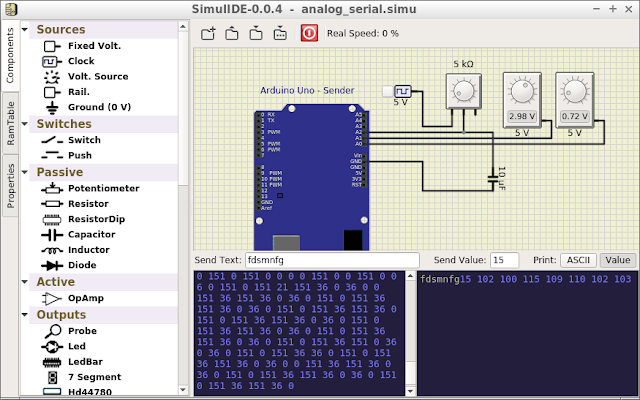 By default clock speed is set to 20 Mhz for Pic and 16 Mhz for Avr and Arduino. Now you are ready to power the circuit and see the simulation. 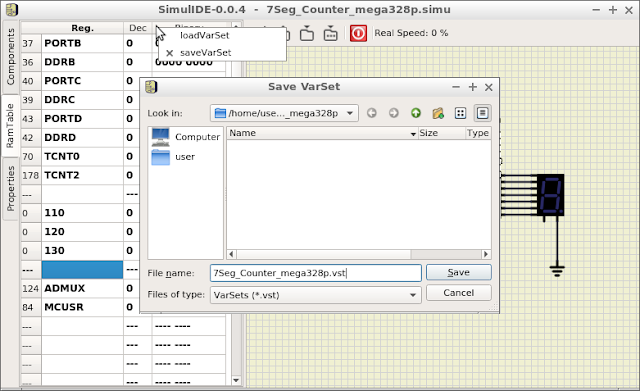 - Open RamTable tab in left panel. You will see register value in decimal and binary in "Dec." and "Binary" boxes. If you type register name, address will appear in the left read-only box as a decimal value. - Right-Click on top part of the RamTable view ( Reg. | Dec. | Binary ). - Load or Save dialog will appear. - Choose the varset you want to load or type varset file name to save. You can monitor first microcontroler uart. 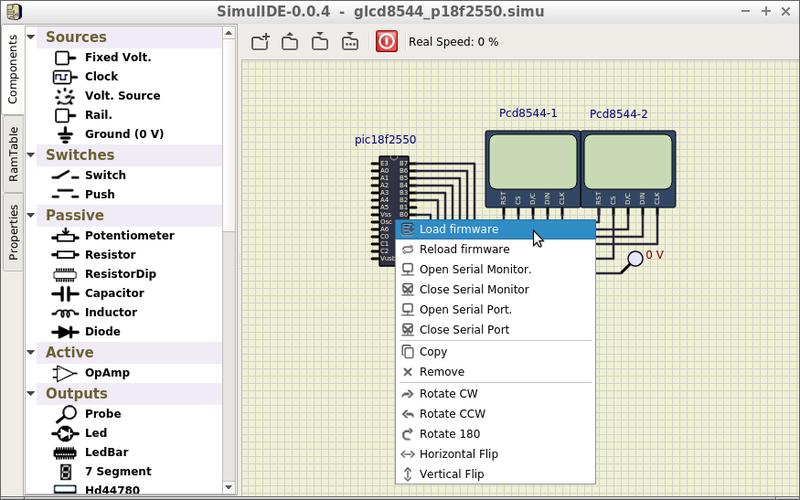 Right-Click on the microcontrlloler and select "Open Serial Monitor", a new widget will appear in the bottom panel. - Left side shows the data sent by the microcontroller. 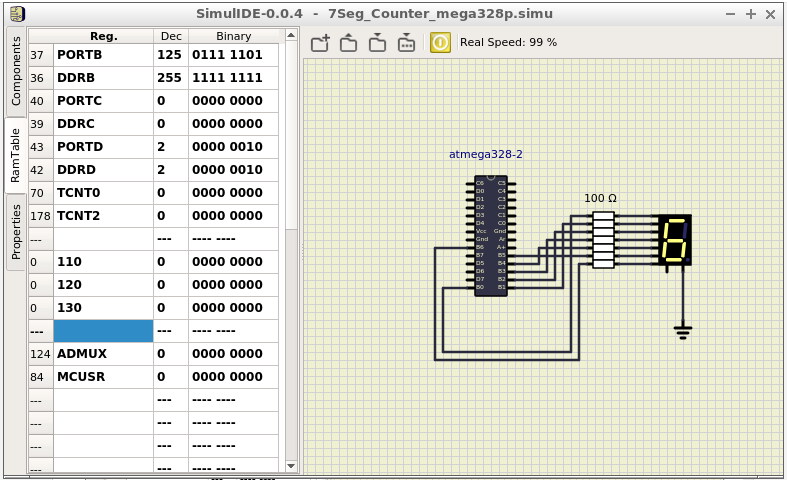 - Right side shows the data received by the microcontroller. You can choose to print de decimal value of the data sent/received or it's related ascii value. - Right-Click on the microcontrlloler. - Select "Open Serial Port". - A new widget will appear in the bottom panel. This is a tipical serial port connection panel, where you can configure, connect and disconect to any serial port you want, being real hardware or virtual ones. In this video you can see it working (from 00:45): Using Serial Port and Monitor.